Last month Slotastic added three new video poker games to its mobile casino last month. 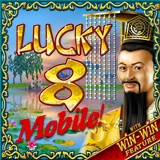 This week they've introduced the Asian-themed Lucky 8 slot game from Realtime Gaming to its new mobile casino. You may have played Lucky 8 in an online casino. It's been really popular ever since it made its debut last Chinese New Year. Now you can play it on your smartphone or tablet. Lucky 8 has RTG's Win-Win feature that makes sure you wins during the bonus round. Slotastic Casino giving 38 free spins on new Lucky 8 mobile slot from Realtime Gaming until November 16th. Many Asian gamblers’ lucky number, 8 is considered to be a symbol of wealth and good fortune in Chinese culture. There are lots of eights in this game. For instance, Lucky 8 symbols trigger 8 free spins, and bonus rounds award up to 8x multipliers. And if bonus round wins are less than 8x the triggering bet, the Win-Win feature awards a bonus of 88x that bet. Slotastic has hundreds of games from RTG and dozens of the best games are also available for iPhones, iPads and Android smartphones and tablets. Mobile casino players can get one deposit per month doubled (up to $444) using coupon code GOTASTIC.